I was today years old when I first heard of Bhad Bhabie, but I'm told she is apparently a rapper with a rags-to-riches story. So, of course, she should get her own reality show. And Snap is pulling out the big guns to promote her Snap Original show, Bringing up Bhabie, with an AR-enabled billboard on the prominent Sunset Strip along with the debut of a Bhad Bhabie single via an AR Lens Challenge. On Friday, the company revealed a trailer for the series and a billboard at 8544 Sunset Strip, an area that has become the most most expensive for billboard media buys outside of New York's Times Square. But this isn't your run-of-the-mill billboard. 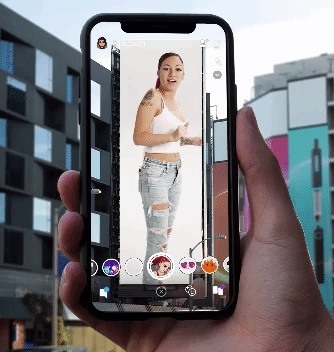 The vertically-oriented billboard has a Snapcode that passersby can scan with the Snapchat app to unlock an augmented reality experience that turns the billboard into a video for Bhabie's antics. The Lens uses image recognition to lock the Lens into position over the billboard and then plays random clips of Bhabie babbling and cursing like a sailor, though the coarser language is bleeped out. The experience is even closed-captioned for the hearing-impaired, but with emojis, because of course. There's a certain charm to the experience, as Bhabie acts as though she can see viewers and the real world surroundings. "Hey, your hair looks bad, there's a salon right over there," she says in one clip (I'm paraphrasing here). That's not all. On Monday, Bhad Bhabie premiered her new single, "Bestie" featuring Kodak Black, through a Lens Challenge, Snapchat's iOS-only answer to the popular lip sync social app TikTok (formerly known as Music.ly). In fact, Snapchat is the only officially-sanctioned place to listen to the track until its release on Jan. 31. To access the Lens Challenge, open the Snapchat camera and tap the screen to access the Lens Carousel. Then, tap the smiley icon at the bottom of the screen to enter the Lens Explorer, Snapchat's showcase of Lenses created in Lens Studio. Users can then lip sync along with the track, with the Lens providing an augmented reality backdrop using Lens Studio's background segmentation feature. The Lens also inserts AR censor strips when bad words pop up in the track (which appears to be often). Users can then share their recordings as Stories to the Bhad Bhabie Challenge collection or the Our Story option for the opportunity to share the spotlight in the app. The show is the latest in the Snap Originals line-up, a TV show format that lives in the Discover section of the Snapchat app. These shows take place in the vertical aspect ratio and average five minutes per episode, making them perfect for so-called Gen Z audiences. In addition, all the shows are capable of inserting AR Lenses into episodes. Debuting on Feb. 4, Bringing up Bhabie follows 15-year-old Bhad Bhabie (whose legal name is Danielle Bregoli, of Dr. Phil fame), her mom, her manager, and others in her entourage. New episodes air daily through Feb. 19, so, if this is your bag, look for it in the Discover page or via Snapchat's search bar. There's a certain poetry in a legacy advertising vehicle like billboards merging with new technology like augmented reality. But that's one reason why augmented reality has become so popular with brands. With image recognition and marker-activated experiences, marketers can turn billboards, posters, and product packaging into virtual portals to fantastic worlds or canvases for 3D content. One day, augmented reality may completely usurp billboards, particularly if the "Hyper Reality" vision of the future comes to fruition. Until then, mobile augmented reality is increasingly giving us a taste of how marketers will reach consumers through wearable AR smartglasses.